If you are a regular barbecuer, you will likely know what works for your BBQ and what doesn’t. If you are a newcomer to the grilling world, you will face several options in your fuel source. When it comes to grilling meats, many people prefer to have that smoky taste which can only be achieved from firing over real wood. When grilling meat over gas, it often leaves it a little more tasteless than tasty as gas has no taste whatsoever, and this is why wooden pellets are favored by many BBQ enthusiasts. In this article, we have found 3 of the best wood pellet products for your pellet grill, so you will be able to grill knowing you will have a super tasty meal at the end of it. Traeger Grills are experts in the grilling department and provide everything from grills to pellets, to accessories and even sauces and rubs. Their Signature Blend Pellets are all natural, and sustainably sourced. We take a look at them in more detail below. 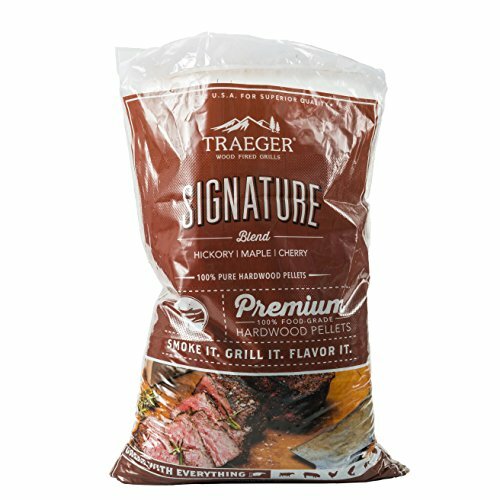 Traeger’s signature blend pellets are the perfect choice for your pellet grill, and are very popular with many grilling enthusiasts. This is due to their high quality and the unmatched pure, hardwood taste that they provide. These premium wood pellets feature a blend of sweet maple, with savory hickory and tart cherry. This means they will give a strong, smoky taste to anything that you grill, guaranteed to make your food delicious. They are also said to provide a good amount of smoke, meaning they are consistent and flavor well. Unlike some pellets which include binding agents and extra fillers, these pellets are completely all natural, giving you peace of mind that no chemicals or added extras can mess with the taste of your food. They are sustainably sourced and manufactured in the US. Thanks to their strong smoky taste, they will complement any meat you grill, and will improve the overall taste. The next wood pellets featured on our list are the BBQ’rs Delight Wood Smoking Pellets. This set includes 6 of the most popular wood smoking pellets, such as apple, mesquite, hickory, cherry, Jack Daniel’s and pecan. We take a look at their key details below. 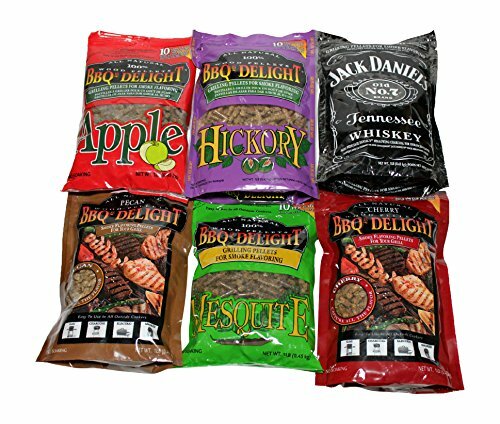 BBQ’rs Delight offer a fantastic 6-pack variety set of wood smoking pellets. This set is perfect as will give you a new choice each time you BBQ, and many different tastes to enjoy throughout the summer. The smoking pellets by BBQ’rs will work with any type of outside grill, such as charcoal, gas, smoker and even electric. This means many people can benefit from their delicious taste which they provide to meat. Included in this set are 6 of the most popular flavors that people use when BBQing. This includes cherry pellets, made of 100% cherry wood, mesquite pellets also make of 100% mesquite, pecan pellets made of 100% pecan wood and apple pellets made of 100& apple wood. The Jack Daniel’s pellets are composed of charcoal soaked in whiskey from the Jack Daniel Distillery in Lynchburg, Tennessee. Whether you have a charcoal, gas, electric or smoker these smoking pellets will work with most outdoor grills. The third and final smoking pellets featured on our list come from CookinPellets and are also 100% hardwood with no fillers. We take a look at these pellets in more detail below. Looking for a bag of quality smoking pellets which can really add flavor to your meats? Then look no further as CookinPellets have the answer with their Premium Perfect Mix Smoking Pellets. Just when you thought you couldn’t get any more flavor from your meat, these smoking pellets are great on the BBQ. The perfect mix includes a hickory base, with cherry, apple and hard maple. These pellets are only made from the center of the log and not bark, meaning they will not contain any lignin binder which is generally found in bark. If you want great taste and great value, you won’t find it anywhere else. 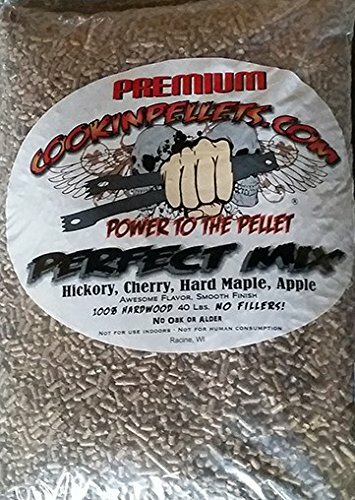 These pellets are 100% hickory and don’t incorporate any oils or filler woods. These smoking pellets will provide the right amount of blue smoke, consistent enough to make your food taste delicious. Your guests will definitely be around more often when using these pellets. 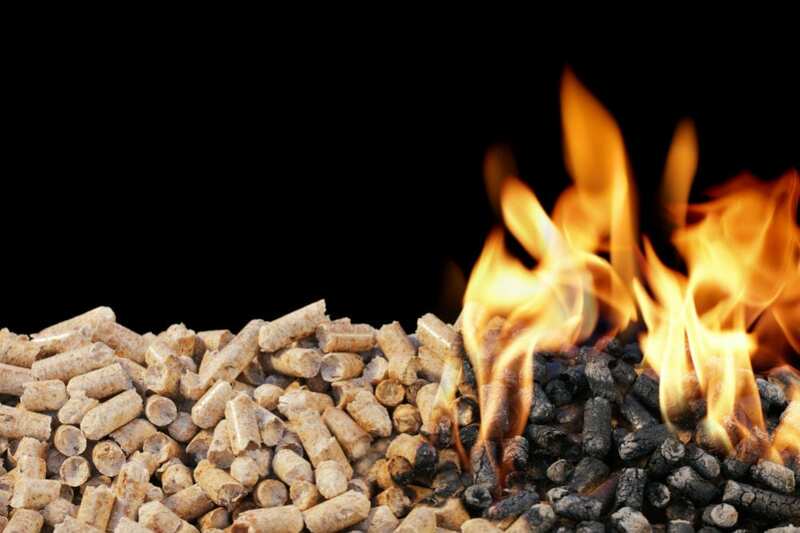 Which are the Best Wood Pellets for Me? All the wood pellets featured on our list are guaranteed to give your meats a real flavor boost on the BBQ. If you are shopping on a budget, perhaps you will be more interested in purchasing cheaper set pellets. A few of these options are suitable for those shopping on a smaller budget. The cheapest smoking pellets are the Traeger Grills Signature Blend which are 100% all-natural hardwood. The second cheapest smoking pellets are the perfect mix pellets by CookinPellets. If you are looking for a way to improve your BBQ, we highly recommend any of the 3 pellets mentioned on our list as they are capable of improving the taste of your grill and keeping your guests happy at the same time.